God�s Word is life and healing to you. The Bible promises God�s children perfect health, so you don�t have to be sick another day of your life. As a Christian, you have all of God�s authority to change your world with your words. And when you speak the Word of God, it is just as if God is speaking. God�s Creative Power of Healing by Charles Capps is the perfect resource to equip you with teaching and healing scriptures in order to receive your promised healing. 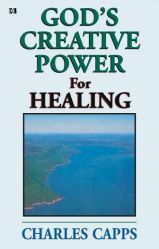 This pocket-sized book contains concise teaching on the principles of healing, as well as a thorough list of Bible promises regarding your health and healing. This book is an excellent gift, or perfect to keep in your car, wallet, or pocket. Let the scriptures in this book be the medicine you need to walk in complete health and wholeness.